Our next installment of 'Learn to Play' is TBA, but check out our last one and check back soon for more info! Learn To Play is a free music class for 14 years of age and up. Each Learn To Play Edition will feature a different instrument for all students to learn. 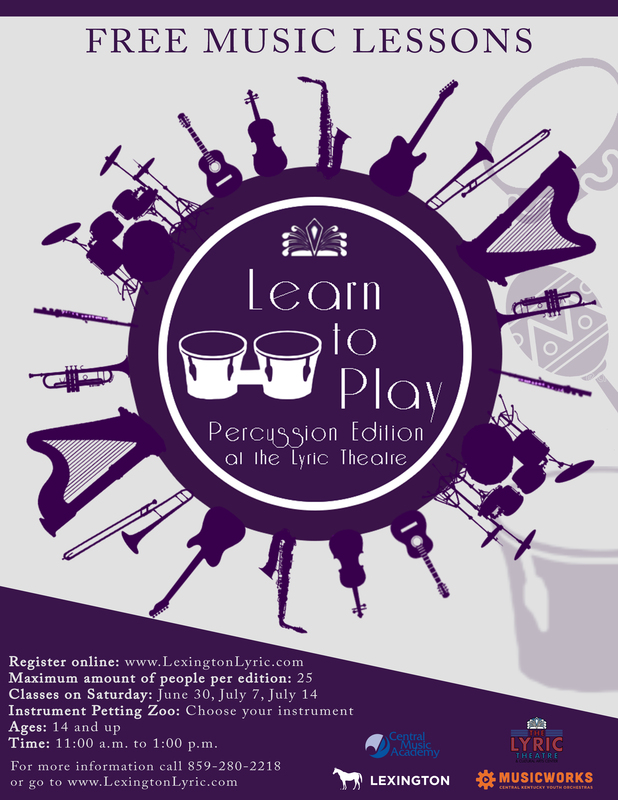 For the second edition of Learn To Play, the instrument will be percussion. This free program is designed to introduce participants 14 and older to playing percussion instruments. Percussion will have three, 2-hour sessions on June 30, July 7, and July 14 from 11:00 AM - 1:00 PM. On July 21, students will then put on a performance at the Lyric Theatre showing off their new skills. Each student will have a chance at an instrument petting zoo, where they will be able to choose a percussion instrument. You can register by calling the Lyric Theatre at (859) 280-2218 or by filling out the registration form below.